In ungreased 13x9-inch (3-quart) glass baking dish, arrange half of cake cubes. In large bowl, mix yogurt, lime peel and lime juice until well blended. Gently stir in whipped topping. Spoon half of mixture over cake cubes in baking dish; press down to smooth layer. 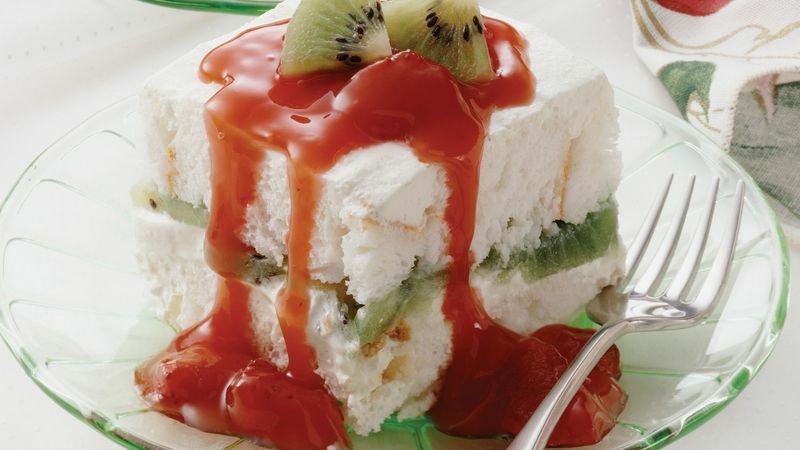 Arrange kiwifruit slices over mixture. Repeat cake and yogurt layers; press down. Cover; refrigerate until set, at least 3 hours. Meanwhile, drain strawberries, reserving liquid in 2-quart saucepan; set strawberries aside. Stir cornstarch into liquid until well blended. Heat to boiling over medium heat, stirring constantly. Remove from heat; cool 15 minutes. Stir in strawberries. Refrigerate until chilled, at least 30 minutes. Bake a foolproof Betty Crocker® angel food cake mix to use in this recipe. Raspberries make a delicious stand-in for the strawberries.